Bakelite, the first plastic based on a synthetic polymer, will mark its 100th anniversary in 2007, and natural polymers were understood a hundred years earlier. Where would food packaging be without plastic? Rather than ponder the question, DuPont Packaging & Industrial Polymers (www.dupont.com/packaging), Wilmington, Del., prefers to give awards to the best use of plastic (not necessarily its own) in food and consumer goods packaging. Winners of the 19th DuPont Awards Competition were revealed in August, and will be honored again in a display at Pack Expo Intl. in Chicago's McCormick Place Oct. 29-Nov. 1. Twenty-six international food and non-food packaging innovations received awards from among 135 entries. All of them use plastic to some degree. Only the food and beverage winners are included here. The highest award given each year is the Diamond Award. "The world's first aseptic transparent stand-up-pouch," this one was designed especially for children's on-the-go drinks. Judges said the package "has a unique soft and squishy feeling and see-through look, which 6-12-year-olds find fun and cool, according to market research in North America and Europe. The aseptic process ensures convenient, safe and portable products with high quality taste and nutritional value without the need for preservatives or hot filling." This can is wrapped with a thin, insulating layer of plastic, which keeps beer cold for longer periods of time, protecting it from warm hands, condensation and outside temperature. It also makes the cans more comfortable to hold. The wrap is DuPont Cool2Go, a product made by placing a polymer insulation between two layers of DuPont Teijin Films' Melinex film. Amcor PET Packaging, Tradewinds Beverage Co.
PowerFlex is the first truly panel-free and rib-free polyethylene terephthalate (PET) container that accommodates hot filling up to 185°F. The use of vacuum panels for hot-fillable PET containers, while accepted industry practice, has held back PET from penetrating premium beverage markets. Amcor developed an ingenious, patented base design that handles the vacuum while keeping the sidewalls free of ribs and panels. The base incorporates a unique diaphragm that draws upward as the liquid cools. The sidewalls create a container with a premium look and feel as well as one that provides maximum freedom for label size, material and application. This redesign will change consumer perception of larger-size containers. The bottle and closure system was designed to provide consumers with a more convenient means of storing, handling, and dispensing ketchup from large (46 and 64 oz.) containers. The package provides consumers with ergonomic grip points while also fitting easily on the door shelves of refrigerators. And the custom-designed closure has a lock-back feature for improved dispensing control and cleanliness. Snack ‘n Seal is a patented packaging system that provides consumers with ease of opening, resealability and increased product freshness. The package consists of a thermoformed tray in a horizontal flow wrap, which incorporates an innovative reclose feature in the top panel. The top panel has a precision die-cut opening to which a pressure-sensitive label is applied. The package contains a widely used high-barrier film structure with technology that had only formerly been used for baby and home care wipes. The shrink sleeve is the most popular label currently in the market because of its ability to fit interestingly molded, contoured containers while conveying brand image in a significant manner. Alcoa improved the graphics for more shelf impact and developed an "anti-wet" overcoat to virtually eliminate the appearance of air bubbles that could become trapped between the label and glass and be visible within the clear portion of the label. PET film was chosen because of the severe differences in shrink diameter down the length of the product profile. The Amcor FlexCan is an easy open and recloseable, stand-up container that's ideal for products that typically are not finished in one serving or use. A peelable lapseal of polyethylene makes it easy to open, and an adhesive tape provides recloseability. A wide opening makes it easy for the consumer to get a handful of nuts directly from the pack or to pour some into a bowl. The design allows the packaging to be printed on all sides, including the bottom and top. With two side gussets and one bottom gusset, the product stands out on the shelf. The side gusset is made transparent so the consumer can see the product before purchase. The pouch is made from five different webs - the front and back and the two side gussets are registered. The format can be adjusted for products such as rice, snack foods, etc. Graham Packaging Co., Martinelli Co., VBS/Cryotech International Inc. 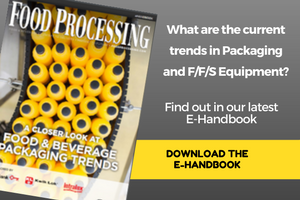 This new technical development breaks the paradigm for hot-fill beverage products in two ways. It eliminates the need for conventional vacuum panels and supporting rib structures. And it is the first successful attempt at employing liquid nitrogen to purge the container headspace and pressurize a hot fill beverage container. This five-layer film expands when heated to allow built-up pressure and steam to escape through multiple micro pores in one layer of the film's composition. The film is airtight and will go direct from the freezer or refrigerator into the microwave without having to vent or slit the packing material. This one time use material acts like a pressure cooker that cooks faster and naturally retains more minerals, vitamins and moisture in the food product. This disposable coffee cup lid is manufactured with color-changing additives, which react with heat. It's brown in its "cold" state but becomes red when it comes in contact with steam or hot liquids. The result is a visual warning to customers that their drink is hot, proof that the lid has been correctly applied and a branding or advertising medium on the top of the lid - which can appear or disappear with heat change. Tetra Pak Inc., Culinary Concepts Inc. The low-acid, microwavable carton in a unique wedge shape - a variation of the Diamond Award winner -- holds and heats either sweet or savory sauces in microwave ovens. It's sturdier and easier to handle and pour from than stand-up plastic pouches typically used to heat ready-made sauces. The package provides brand owners the ability to offer high product quality and taste, protected ingredients, shelf stability and no need for preservatives. The core innovation uses PET film coated with a plasma deposition of SiOx embedded in a paper laminate. "It is one of the most sustainable packages on the market with over 75 percent of content made with renewable materials," judges wrote. UPCs are printed in the transverse direction and print copy is located within view, from all angles on the Snickers bar wrap. The development of these technologies was a two-year process involving multiple trials both on press and on the packaging line. Enormous amounts of data were collected to validate the consistency of transverse direction-printed UPCs. All of the effort resulted in a package that met the brand's need but did not compromise UPC integrity or packaging line speed. The ability to increase branding "real estate" on a package will be significant to brand managers across the industry. The new material and shape for the Nestle box includes transparent packaging for the chocolates to better attract consumers. The upper seal is designed in such a way that it consists of four identical latches ensuring effortless packing and removal of its high-quality contents. DuPont sponsors the competition in cooperation with Campden and Chorleywood Food Research Assn. in Gloucestershire, England, and the Washington-based Food Products Assn. Entries are evaluated on degree of innovation, breadth of application, significance or impact on industry or consumers, marketing innovation of the packaged product and impact of the packaging on consumer or industry buying decisions. Since it inception in 1986, the competition has given 185 awards among more than 900 entries from more than 40 countries.